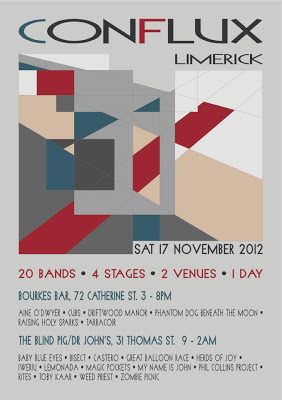 Things don't get much better on the musical front than they do this Saturday in Limerick. Thanks to some very enthusiastic local supporters, we get to hear over 20 acts on four stages, all for one low price... which goes to the Red Ribbon campaign anyway. So, no excuses! Besides, I will be appearing live, playing actual music in an actual band (definitions of both terms remaining suitably flexible) for the first time in... oh, maybe forever. Details follow. Things kick off at 3pm in the basement stage of Bourke's Bar with avant-harpist Áine O’Dwyer back in Limerick for the occasion. The venue will be candle-lit and appropriately spooky for a procession of new folk psychedelic acts, including David Colohan's Raising Holy Sparks. Like Damo Suzuki and other cool dudes, David picks up local musicians wherever he travels, recruiting them for spontaneous drones in a devotional orbit. Saturday it is my turn! I'll be playing infinite viola, for the first time ever. Though not for the last time since it is, you know, infinite. Nonetheless, don't miss Raising Holy Sparks at 6:15pm, or all you'll have to remember us by are the faint reverberations as the Earth's axis readjusts to our great attuning. Events at the Blind Pig Complex (what I now call the three floors of musical mayhem at the corner of Thomas and Foxbow) begin at 9pm and proceed until late. Don't miss the debut performance of instrumental prog group Zombie Picnic, the ever-popular Seadog, and two grown men on toy drum kits known as the Phil Collins Project. Plus DJ and electronic stuff, rap and more, upstairs at the very lovely Dr. John's. For all the details you can check out the Conflux website, or just drop by and soak up the new sounds. Thanks to organisers Kat and Damian for an amazing day. And to all the bands that played... heard some great music from acts I was previously unaware of. And nice to have UBS back in Limerick.